The Dark Energy Survey has discovered 17 dwarf galaxy candidates in the past six months, leaving scientists to believe that there could be many more galaxies hiding in our cosmic neighborhood. Scientists on the Dark Energy Survey, using one of the world’s most powerful digital cameras, have discovered eight more faint celestial objects hovering near our Milky Way galaxy. Signs indicate that they, like the objects found by the same team earlier this year, are likely dwarf satellite galaxies, the smallest and closest known form of galaxies. Scientists can only see the faintest dwarf galaxies when they are nearby, and had previously only found a few of them. If these new discoveries are representative of the entire sky, there could be many more galaxies hiding in our cosmic neighborhood. In March, researchers with the Dark Energy Survey and an independent team from the University of Cambridge jointly announced the discovery of nine of these objects in snapshots taken by the Dark Energy Camera, the extraordinary instrument at the heart of the DES, an experiment funded by the DOE, the National Science Foundation and other funding agencies. Two of those have been confirmed as dwarf satellite galaxies so far. Prior to 2015, scientists had located only about two dozen such galaxies around the Milky Way. The closest of these newly discovered objects is about 80,000 light-years away, and the furthest roughly 700,000 light-years away. These objects are, on average, around a billion times dimmer than the Milky Way and a million times less massive. The faintest of the new dwarf galaxy candidates has about 500 stars. 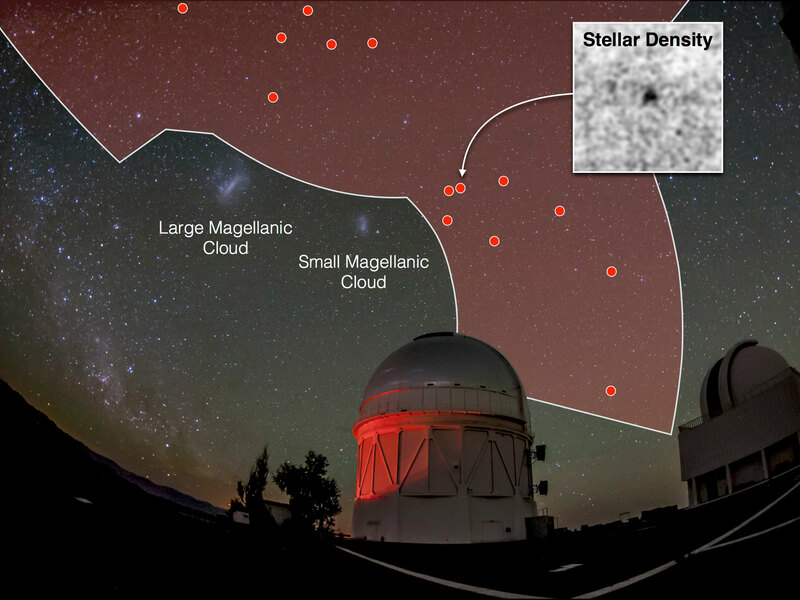 Most of the newly discovered objects are in the southern half of the DES survey area, in close proximity to the Large Magellanic Cloud and the Small Magellanic Cloud. These are the two largest satellite galaxies associated with the Milky Way, about 158,000 light-years and 208,000 light-years away, respectively. It is possible that many of these new objects could be satellite galaxies of these larger satellite galaxies, which would be a discovery by itself. Since dwarf galaxies are thought to be made mostly of dark matter, with very few stars, they are excellent targets to explore the properties of dark matter. Further analysis will confirm whether these new objects are indeed dwarf satellite galaxies and whether signs of dark matter can be detected from them. The 17 dwarf satellite galaxy candidates were discovered in the first two years of data collected by the Dark Energy Survey, a five-year effort to photograph a portion of the southern sky in unprecedented detail. Scientists have now had a first look at most of the survey area, but data from the next three years of the survey will likely allow them to find objects that are even fainter, more diffuse or farther away. The third survey season has just begun. 2 Comments on "Dark Energy Survey Finds New Dwarf Galaxy Candidates"
Seems our “scientists” still haven’t figured out the whole universe is in rotation, just like planets around a sun, except the universe still hasn’t completed a single rotation as yet. @Thomas: The universe is not observed to possess a rotational vector.